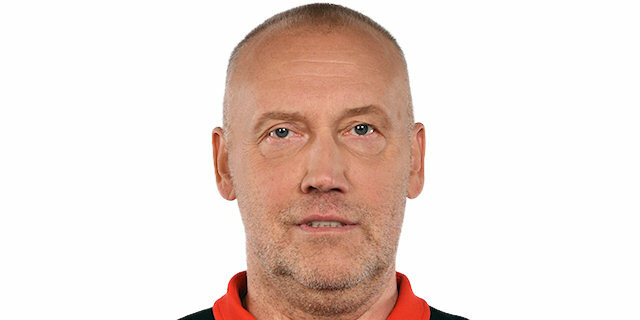 CSKA Moscow hit 16 three-pointers to get past crosstown rival Khimki Moscow Region 108-98 at Megasport Arena in the Russian capital on Thursday. 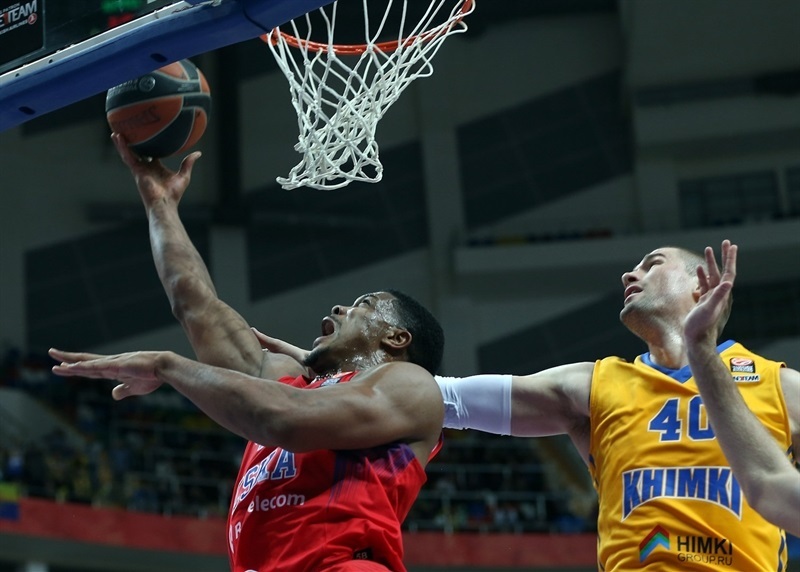 It was the fourth consecutive win for CSKA, which improved to 6-2 to secure at least a share of the lead in Group F, while Khimki dropped to 4-4 with its third straight loss. Nikita Kurbanov led CSKA early to an 18-16 lead, but Tyrese Rice did it all for Khimki, and his back-to-back threes put Khimki up 40-41. But that turned out to be the only visitors’ lead of the night, as Milos Teodosic and Nando De Colo took over after the break. 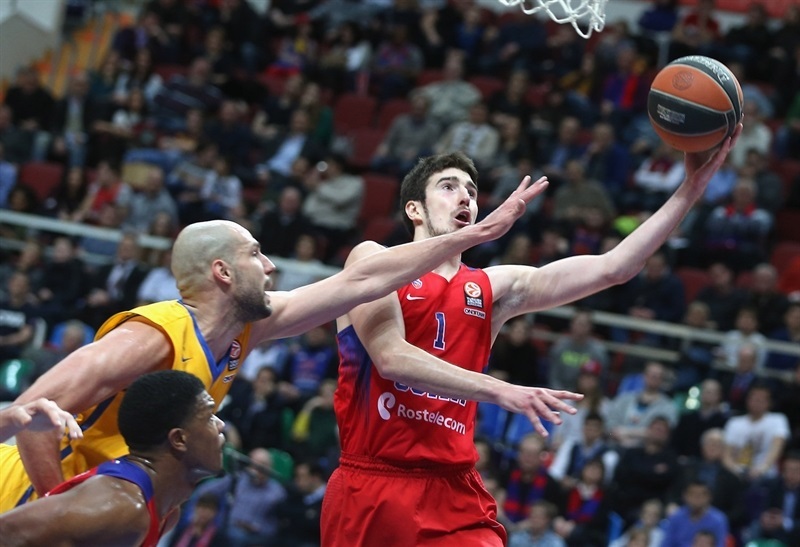 Teodosic scored 19 of his 26 points and De Colo 14 of his 19 in the second half, as CSKA held multiple double-digit leads, but did not seal the deal until putting together a 13-2 run late in the fourth quarter to lead 102-86. Teodosic shot 6 for 9 from three-point range, and De Colo dished 8 assists. Kurbanov finished with a career-high 18 points, Kyle Hines scored 11, while Victor Khryapa had 10 points, 11 rebounds and 2 blocks in victory. 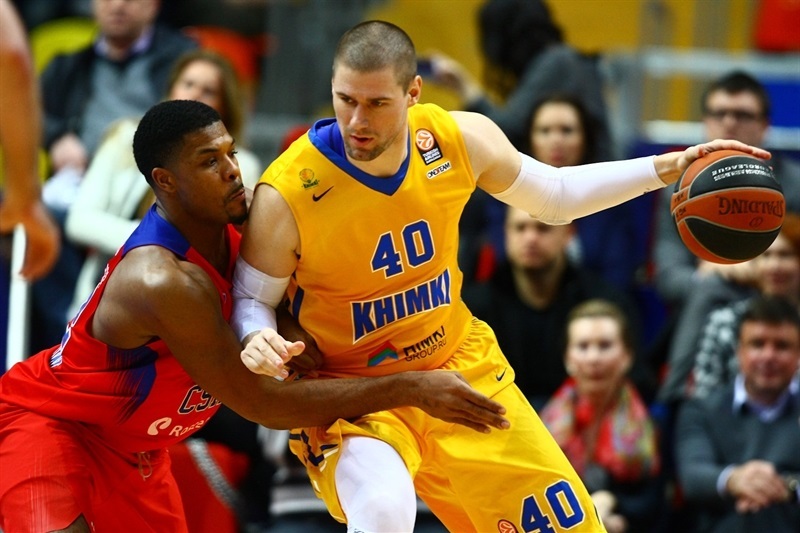 Rice paced Khimki with 16 points and 12 assists. Alexey Shved also scored 16, Petteri Koponen netted 15 points, Zoran Dragic added 12 and James Augustine 11 in the losing effort. Aaron Jackson and Kurbanov hit back-to-back three-pointers to make it 6-0 and force visiting coach Rimas Kurtinaitis to call a timeout after only 68 seconds. Tyler Honeycutt opened Khimki's account by splitting free throws, and after Kurbanov finished a fast break with a dunk, Koponen hit a long jumper and Sergey Monia a three-pointer for Khimki to get within 9-6. Khryapa answered with a triple and then worked his way inside for a short fadeaway jumper. Kurbanov made a steal at the half-court line, then scored a fastbreak layup while drawing a foul. On the ensuing free throw, Khryapa’s put-back capped a 9-0 run and opened an 18-6 margin. However, Honeycutt and Koponen hit back-to-back triples to halve the deficit, before Rice assisted Augustine for a score inside. Teodosic fed Andrey Vorontsevich for a big and easy baseline dunk, and after Rice made a tough runner, Teodosic nailed a long jumper, 24-16. 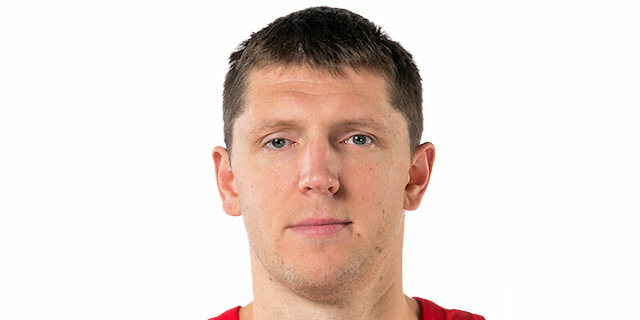 Before the quarter’s end, however, Josh Boone in his Euroleague debut for Khimki fed a cutting Dragic for a reverse layup, and after a pair of foul shots from Teodosic, Paul Davis made a turnaround jumper to put 28-23 on the scoreboard after 10 minutes. Cory Higgins drove for a layup, but Shved nailed a triple and Boone knocked down a long jumper to get Khimki within 31-28. Vorontsevich answered with a long jumper, before Teodosic hit a wide open three to make it 36-28. 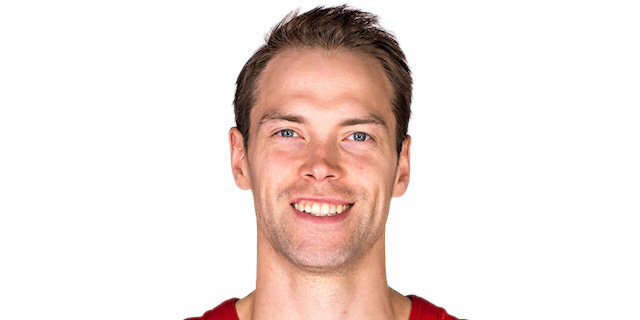 But Dragic banked in a triple for the visitors, and after a put-back by Hines, Rice fed Dragic for a fasbreak layup before nailing back-to-back triples that gave Khimki its first lead, 40-41. 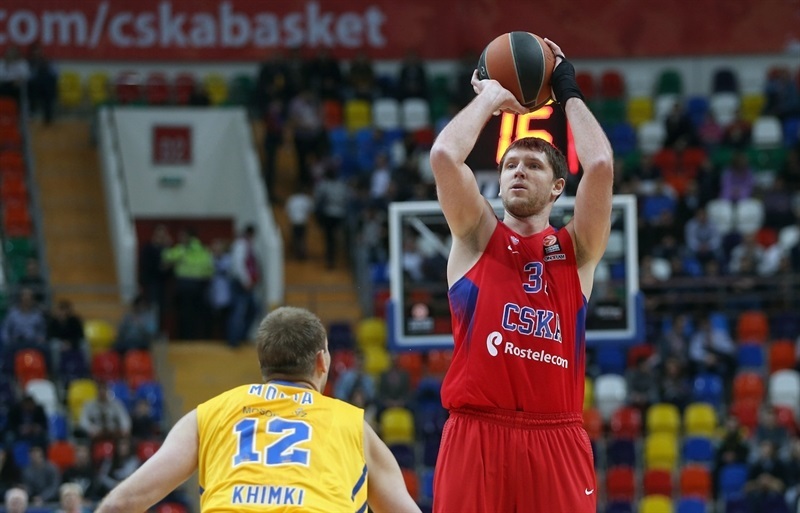 After a CSKA timeout, Khryapa hit a three and Higgins scored a driving layup. 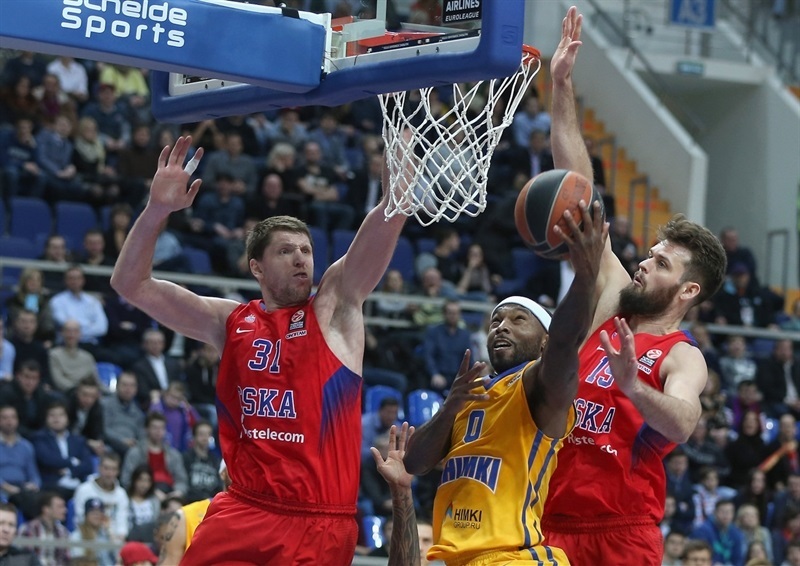 Augustine scored inside twice for Khimki, but Jackson hit a triple for the hosts, and De Colo hit from way downtown as time expired to give CSKA a 53-46 halftime lead. Augustine scored inside to start the scoring in the second half and after a jumper from De Colo, Rice fed Shved for a fastbreak dunk and to get within 55-50. 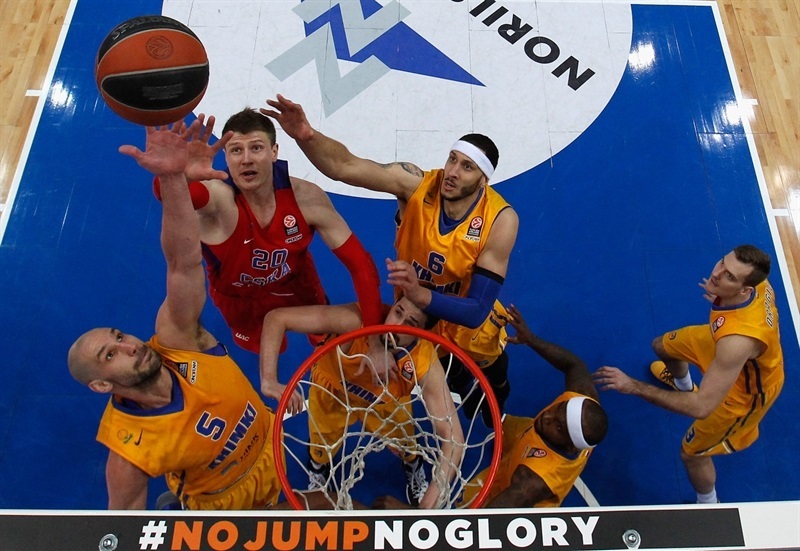 But Kurbanov made a put-back and Teodosic nailed a three-pointer. After a driving layup Rice, Kurbanov drove for a big two-handed slam. 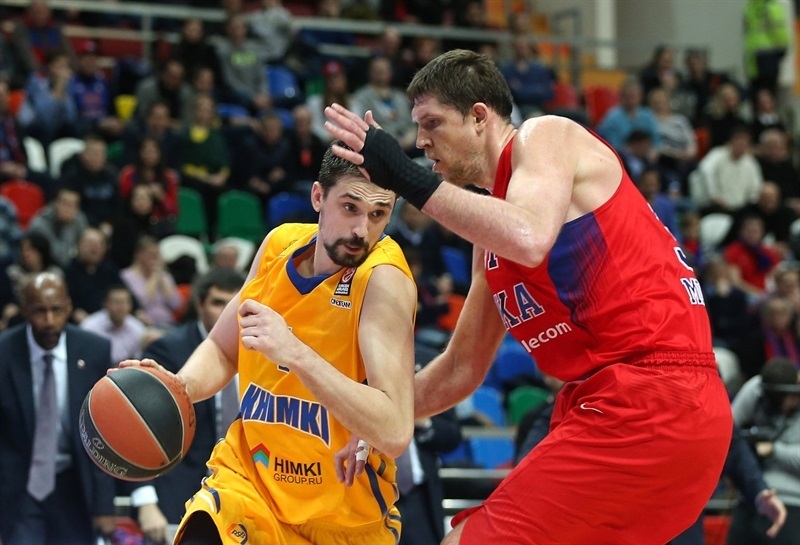 Khimki countered with a tip-in from Boone, but De Colo knocked down a corner three to restore a double-digit margin, 65-54. 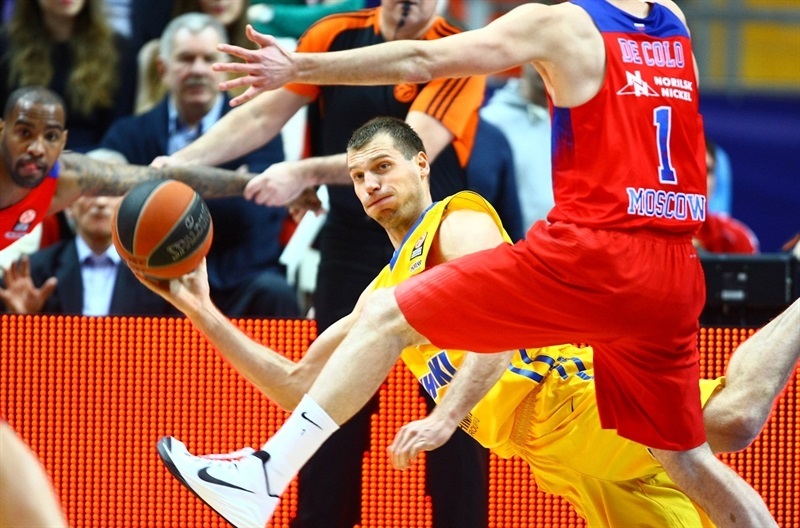 Shved answered with a three-pointer for Khimki, and made a floater-plus-foul that cut the deficit to 67-60. Kurbanov answered with a three-point play of his own, and Teodosic made foul shots that made it 72-60. Dragic finished a fast break he initiated with a dunk, and after Davis and Todosic traded a pair of foul shots, Teodosic buried a three-pointer to open a 77-64 lead. Boone’s put-back dunk just before the buzzer made it 77-66. Teodosic opened the fourth quarter with a triple, but Augustine answered with a three-point play. Vorontsevich made a three-pointer too, and after Shved’s jumper, Kurbanov scored inside to make it 85-71. Dragic and Kurbanov traded baskets inside, but after a Khimki timeout, Rice with a floater and Koponen with a fastbreak layup fueled a 0-6 run, Hines snapped it by driving for a layup, but Koponen hit one from outside to get Khimki within 89-82. 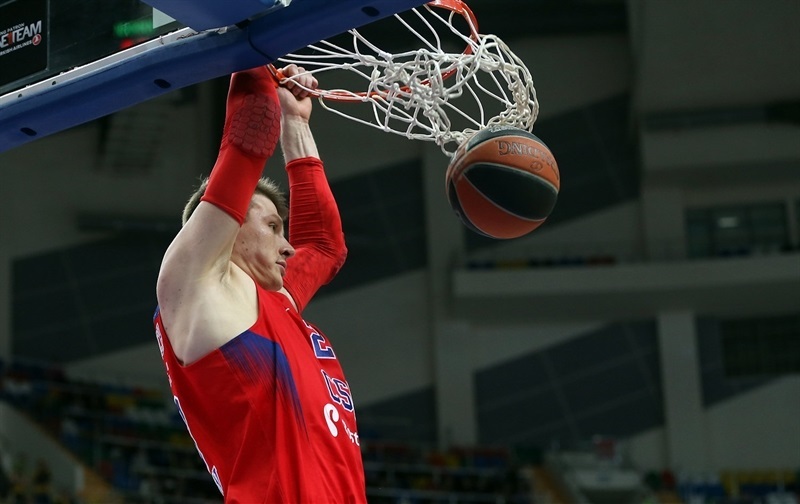 Shved’s free throws made it a 5-point game, but De Colo nailed a corner triple and Teodosic hit his fifth from long range on the next trip down the floor, making it 95-84. 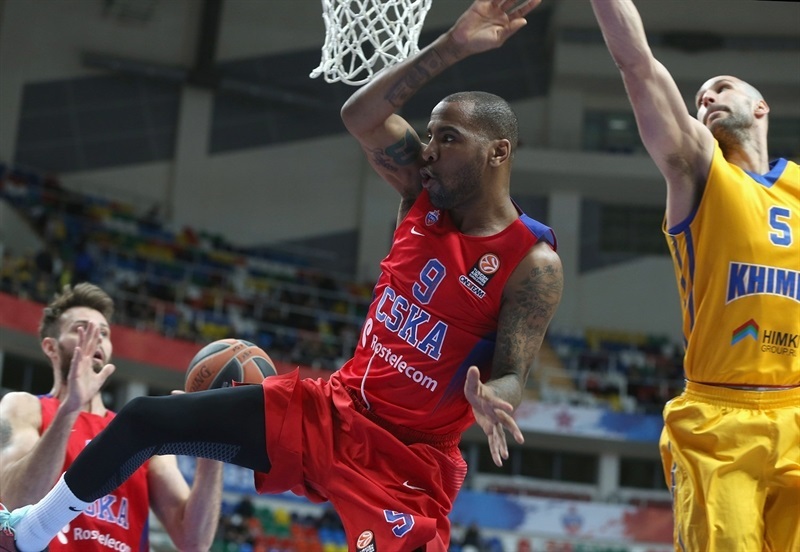 Teodosic’s sixth triple and a Hines put-back helped CSKA to a 102-86 lead – its biggest of the night. Khimi answered with a 0-9 run, which Koponen started with a triple and Rice continued with a layup before Honeycutt scored twice inside. But De Colo’s second-chance three-pointer with 17 seconds to go put CSKA back into double digit lead. Monia’s three in the final seconds rounded out the scoring.